After seeing Quint’s boat, Orca, list and sink at the end of Jaws and it still at the bottom of the sea off Amity Island at the start of Jaws 2, it’s a safe bet to say that we’d never thought we’d see Orca set sail again. But now, thanks to Ron Hawes, we can, even if it is a remote control model that is just over four feet long, from pulpit to stern. The Daily Jaws caught up with Ron who lives on the coast in Essex, on the south east of England. The detail on his Orca is amazing, even more so when you consider that it was built from scratch seven years ago, something that we are sure that Jaws Production Designer Joe Alves, who built the original Orca, would find impressive. It’s got everything from part of an old 35mm film case to make the port hole in the cabin to a motor from a battery drill to run it. 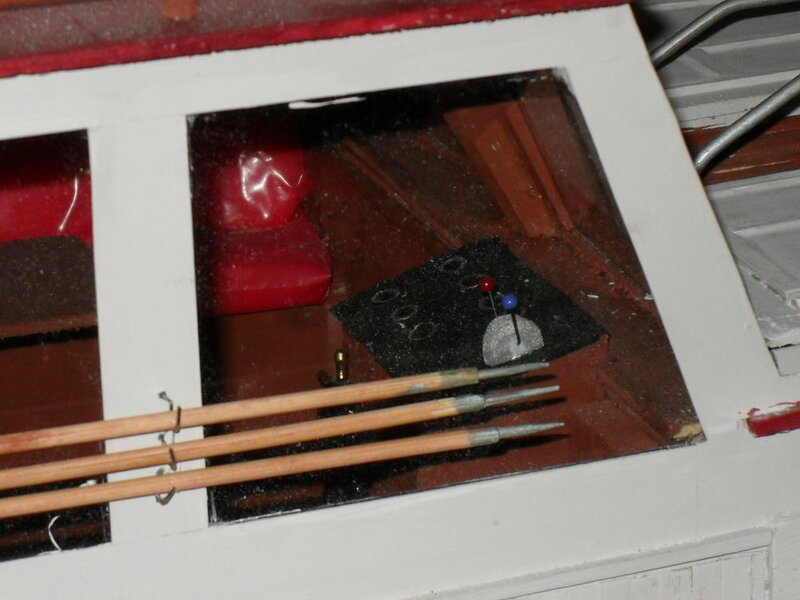 The stern and keel are the leftovers from a mahogany window sill, McDonald's coffee stirrers clad the cabin and its pleasing to see that there’s an old fishing rod tip for mast bits of wooden glue pins. And the incredible ingenious use of everyday objects continues on the inside, where there is an old carrier bag to make the red interior seats. All in all it took him six months to complete, aided by the fact that he was unfortunately out of work at the time. Although the boat was out of action for a while, Ron – who clearly doesn’t have city hands – has been in his shed in his yahd (not too far from the cah) doing some small repairs to get it sea worthy again. So why did he decide to even attempt to build a fully working model of Orca? Ron said: “I wanted to build the Orca because I'm a huge Jaws fan and also wanted a challenge as there weren’t any kits or decent plans available as I prefer to build radio controlled boats from scratch. Ron’s been a lifelong fan of Jaws; his parents took him to see Jaws when it first came out at the Plaza cinema in Leicester Square London, which Ron remembers as being one of the first, if not the first UK cinema to show Jaws. He recalls Jaws photos plastered all over the entrance as they walked in. Enjoying the experience he then preceded to visit Ilford Palladium to watch the Steven Spielberg classic again and again, a total of nine times, and it is still a film that is a firm favourite to this day. Ron’s remote control Orca has had that same captivating effect on people when he has taken it out on the water, unsurprisingly it always gets plenty of attention. He said: “Every time I have taken the Orca out people recognise it from the film straight away, I always get comments like ‘you need a bigger boat’ or someone doing the Jaws theme. I’ve even had a woman say ‘I've never understood why men come sail little boats here but seeing yours makes me understand why now, it's amazing’. Like the actual Orca its smaller cousin has also been subject to animal attack. Last time it was taken out on the pond (just do it for the old man) it was almost life imitating art as it was attacked by a great white…great white swan that is. No doubt it had black eyes, like a doll’s eyes. The swan followed Orca around Southchurch Park pond as Ron brought it towards him, the swan jumped out the water – sounds familiar – and attacked it, luckily it just broke the mast and knocked a few small fittings off it, allowing Ron to sail it back to the bank. The swan swam simply away. And just for the record, Ron also decided he needed a bigger boat after all, he has a nearly 10 foot long model of the Titanic in his garage. Something tells us that it’s just the tip of the iceberg of this man’s talents.